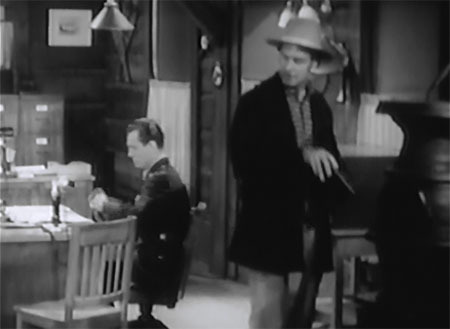 Above: Hal Taliaferro in the Roy Rogers B-western Border Legion (Republic, 1940). The lanky, drawling Hal Taliaferro defied typecasting more consistently than any other regular B-picture and chapterplay performer. Even equally versatile contemporaries like Tom London and George J. Lewis went through long career periods during which they played almost nothing but henchmen, but Taliaferro was never confined to one type of role for any great length of time–save for a stint as a leading man in the silent era. His busy sound-era career in B-westerns (and his somewhat more sporadic serial career) saw him cast as everything from clean-cut heroes to cheerfully disreputable sidekicks to level-headed sheriffs to sneeringly belligerent outlaws; whatever his role, his performance was always vivid, individualized, and completely credible. Hal Taliaferro was born Floyd Taliaferro Alderson in Sheridan, Wyoming, but grew up on a family homestead in Montana; he and his two brothers did some homesteading themselves as teenagers, starting the “Bones Brothers” ranch circa 1910. However, Floyd left the ranch in 1915–working as a stagecoach driver in Yellowstone Park and then serving in the army during World War 1; by 1920 he was living in Hollywood, and was listing his occupation on census forms as “Actor–Motion Pictures.” His riding skill won him work as a stuntman and occasional supporting actor in movie Westerns during the first half of the 1920s; in 1925, he began playing starring roles (using the screen name of Wally Wales) in a long series of low-budget Westerns for a studio called Action Pictures. Wales kept working as a cowboy star at Action until the studio closed down in 1928; he then became an acting freelancer during the remaining years of the 1920s and the first half of the 1930s–taking many bit parts but still frequently returning to leading-man status in cowboy movies for other low-budgeted studios like National Players and Hooper-Connell Productions. He didn’t adopt his most familiar screen name until 1936–using Wally Wales and (occasionally) Walt Williams before then–but, to avoid confusion, I’ll be referring to him as Hal Taliaferro throughout the rest of the article. One of Taliaferro’s early-1930s leading-man roles came in The Voice from the Sky (1930)–one of the very first all-talking chapterplays, in which he co-starred with popular silent-serial heroine Neva Gerber. The production of this western/sci-fi outing, the work of an outfit called G.Y.D. Productions, was plagued by technical and financial problems; the serial received limited distribution and remains lost to this day, leaving only lobby cards and a (recently surfaced) copy of its script to testify to its existence. Taliaferro, it seems, played Jack Deering, a government agent who battled foreign spies as he tried to run down a mad scientist in the modern-day American West. 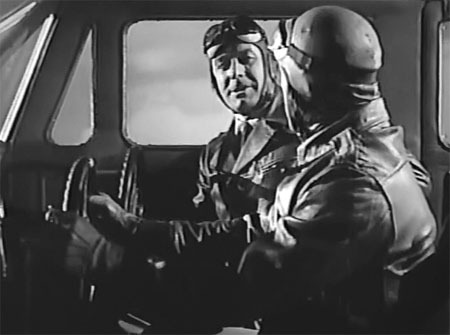 Above: Hal Taliaferro is surprised by heavies Cliff Lyons (center) and Al Haskell (with eyepatch) in The Voice from the Sky (G.Y.D. Productions, 1930). Taliaferro’s bit parts began to outnumber his starring roles as the 1930s advanced; his next serial turn, in the 1933 Mascot chapterplay The Mystery Squadron, definitely fell into the former category; he was cast as a henchman who received almost no dialogue and very little screen time. The Lost Jungle, another Mascot serial, also gave him an extremely minor role; he remained in the background and dropped out of sight for chapters at a time as a member of a group of mutinous sailors. 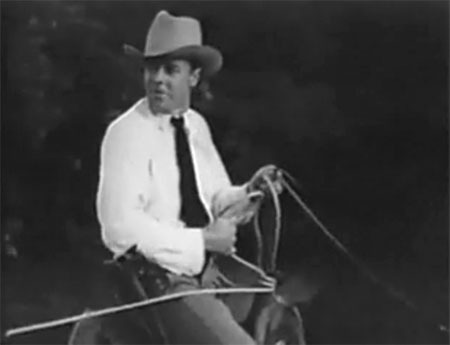 He fared a little better in his third Mascot serial, The Law of the Wild (also 1934); though he only appeared in one sequence as a deputy named Tom, he got to take part in a horseback chase, show off his prowess with a lariat, and engage in a humorous battle of wits with comedic sidekick Ben Turpin. Above: Syd Saylor (foreground) puzzles over a wisecrack by Wheeler Oakman (striped shirt, back to camera), to the amusement of Hal Taliaferro (far right) in The Lost Jungle (Mascot, 1934). Above: Hal Taliaferro in The Law of the Wild (Mascot, 1934). Taliaferro played slightly more noticeable minor parts in Mystery Mountain (Mascot, 1934) and Rustlers of Red Dog (Universal, 1935). 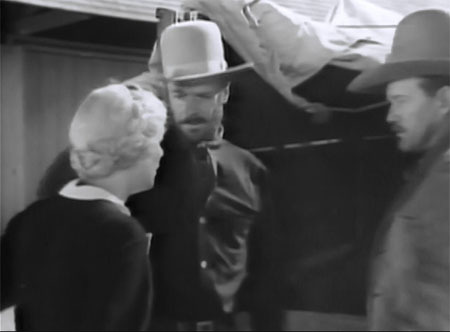 In Mountain, he had a recurring role as a tough but loyal teamster employed by leading lady Verna Hillie’s freight-wagon company, while he appeared throughout Rustlers as a wily and laid-back outlaw named Wally, one of the members of villain Harry Woods’ rustler band. The science-fiction serial The Phantom Empire (Mascot, 1935) cast Taliaferro as one of the Thunder Riders, a cavalry unit that guarded the borders of the futuristic underground realm of Murania; he only received one dialogue scene, spending most of his screen time beneath a face-concealing helmet as he and his fellow Riders silently galloped around in pursuit of hero Gene Autry (who owned a ranch located directly above Murania). 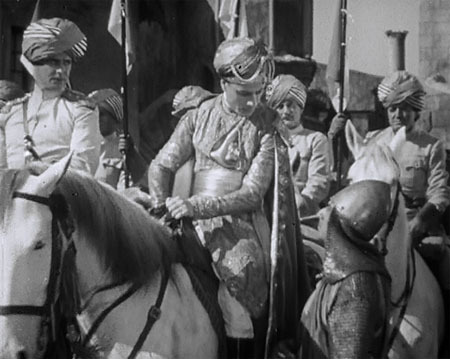 Taliaferro had a similar part in The Call of the Savage (Universal, 1935), appearing in the last two chapters as the captain of the lancers of the lost jungle kingdom of Mu; his activities here were limited to yelling “charge” and leading his horsemen in an attempt to run down the good guys. 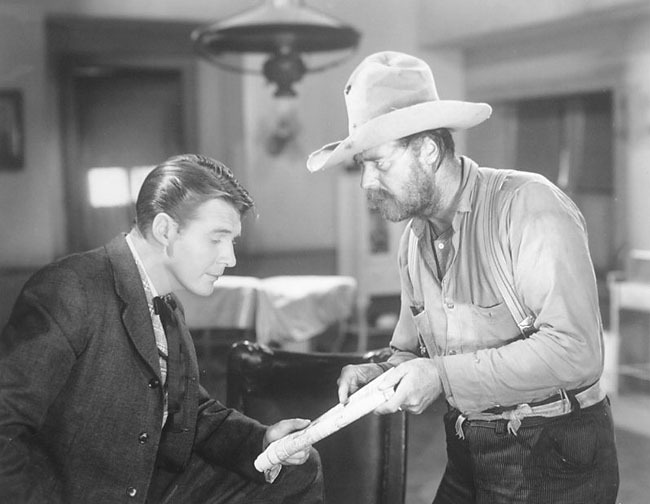 Above: Hal Taliaferro and Jack Rockwell register silent sympathy as Verna Hillie looks into the wagon that holds the body of her murdered father in Mystery Mountain (Mascot, 1934). 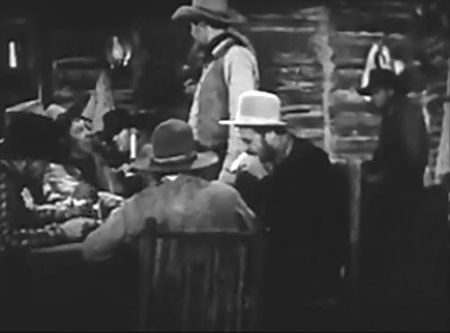 Above: Hal Taliaferro (seated, far right) eats his lunch and ignores Edmund Cobb (standing, center), who’s trying to declare himself the leader of The Rustlers of Red Dog (Universal, 1935) after the (supposed) death of outlaw chieftain Harry Woods. 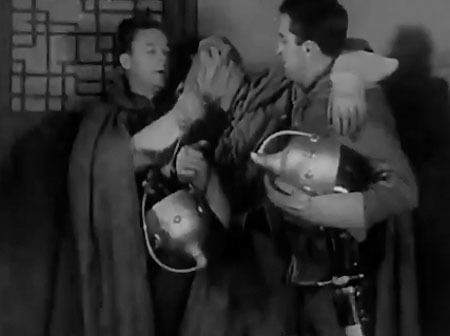 Above: Hal Taliaferro removes the “breathing mask” of a wounded fellow-soldier as they draw closer (via elevator) to the restorative “pure” underground air of The Phantom Empire (Mascot, 1935). 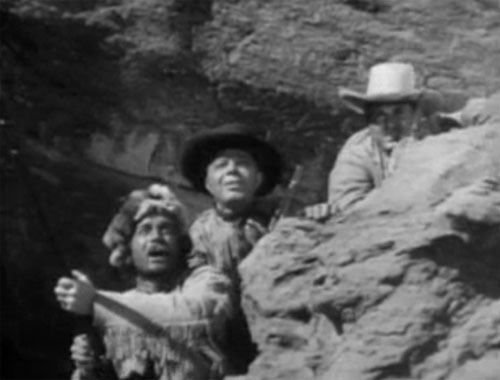 Above: Hal Taliaferro (far left) watches as John Davidson (on the white horse) receives important information in The Call of the Savage (Universal, 1935). The Miracle Rider (Mascot, 1935) featured Taliaferro as a Texas Ranger named Burnett, who assisted leading man Tom Mix in many chases and shootouts throughout the serial, occasionally discussed plans with him, cracked a good-natured joke at him in one scene, and display amusing puzzlement over a long-winded doctor’s report in another; this was the most noticeable “background” serial role Taliaferro had yet played. In 1936, he took an even more prominent supporting part in the Universal chapterplay The Phantom Rider–portraying a crafty cowpoke named Lew, who was secretly working with a band of rustlers; this role allowed him to spin lies with cheerful audacity, cagily spy on the good guys, and react with slightly comic annoyance when unforeseen circumstances interfered with his espionage work. 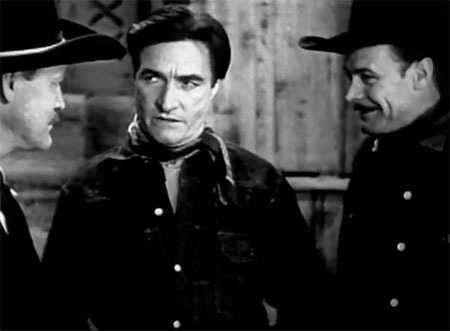 Above, left to right: Jack Rockwell, Tom Mix, and Hal Taliaferro in The Miracle Rider (Mascot, 1935). 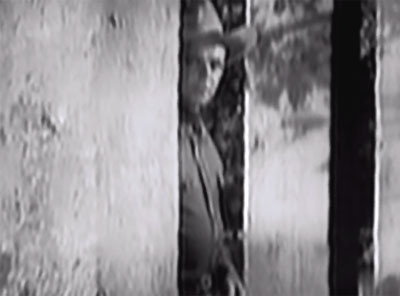 Above: Hal Taliaferro lurks in The Phantom Rider (Universal, 1936). 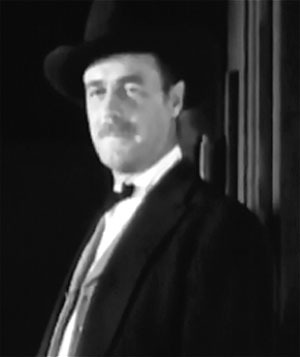 By late 1936, Taliaferro’s career as a leading man had ended, but his character-acting career had begun in earnest; the remaining years of the 1930s would find him taking many good-sized roles as sidekicks, heavies, lawmen, and other characters in B-westerns for studios like Republic, Columbia, and Universal. In late 1936 (as aforementioned), he made his transition from cowboy star to supporting player official, dropping “Wally Wales” in favor of the brand-new name of “Hal Taliaferro.” His first serial appearance under his new moniker was in The Painted Stallion (Republic, 1937), a lively Western saga which featured him as famed frontiersman Jim Bowie, one of several historical characters who aided fictional hero Clark Stuart (Ray Corrigan) in his fight to establish a trade route to Santa Fe. Taliaferro made the most of this larger-than-life role, playing the part with an easygoing swagger and a sly, deadpan sense of humor; particularly entertaining were the casual but confident way in which he tossed around Bowie knives and the wryly humorous style in which he tossed off wisecracks in the midst of fierce battles. 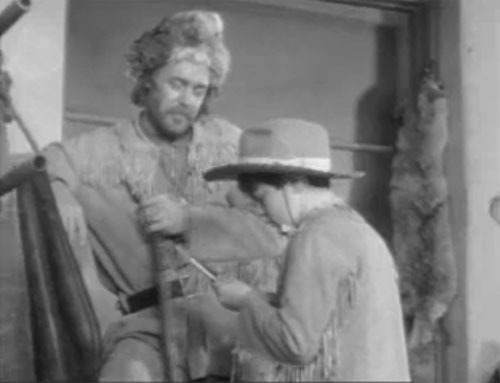 Above: Jim Bowie (Hal Taliaferro) watches as young Kit Carson (Sammy McKim) examines one of the famous Bowie knives in The Painted Stallion (Republic, 1937). Above: “Two out of two ain’t bad.” Hal Taliaferro congratulates himself after plugging a couple of outlaws in The Painted Stallion. Ray Corrigan is on the far right, Hoot Gibson in the center. The Lone Ranger (Republic, 1938) gave Taliaferro one last cowboy-hero role as Bob Stuart–one of five valiant Texans who assisted the masked Lone Ranger in his fight against the tyranny of a rapacious politician-outlaw (Stanley Andrews). 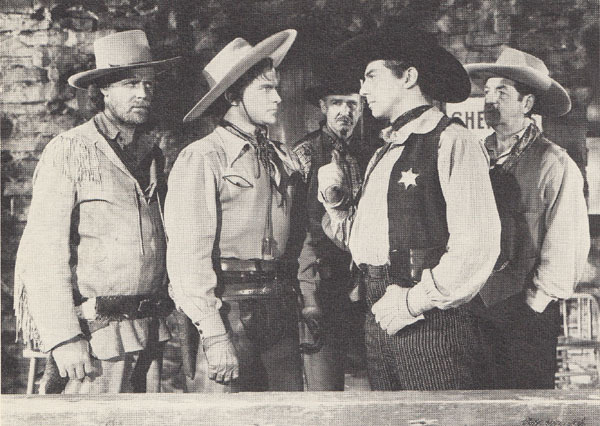 Taliaferro, along with the serial’s other four co-heroes (Lee Powell, Herman Brix, Lane Chandler, George Montgomery), was hinted at times to be the Ranger himself; though Taliaferro’s character (who was killed off in Chapter Eleven) ultimately didn’t turn out to be the Ranger, he frequently got to take the lead in planning strategies or during action sequences, handling his heroics with dash and cheerfulness. He also received the most compelling solo scene of any of the five co-heroes–in which he confronted the murderers of his blacksmith uncle in a cantina–announcing his presence to them by entering a poker game and anteing up with some of the silver bullets his late uncle had been manufacturing for the Lone Ranger; Taliaferro’s character was mortally wounded in the subsequent gunfight, but not before accounting for most of the killers. 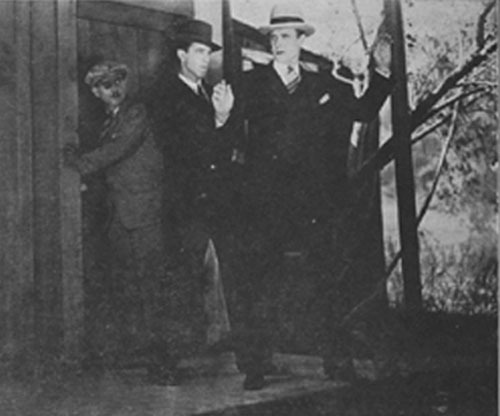 The quiet wrath and steely determination which Taliaferro conveyed during this showdown scene was very memorable, and contrasted dramatically with the affability he had displayed in most of the serial’s earlier episodes. 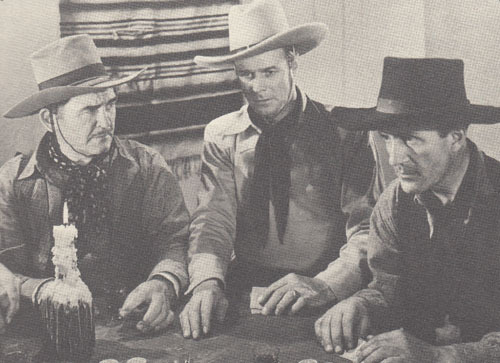 Above: Hal Taliaferro is about to reveal some silver bullets and begin the poker-game showdown sequence in The Lone Ranger (Republic, 1938). Bud Osborne is at left. 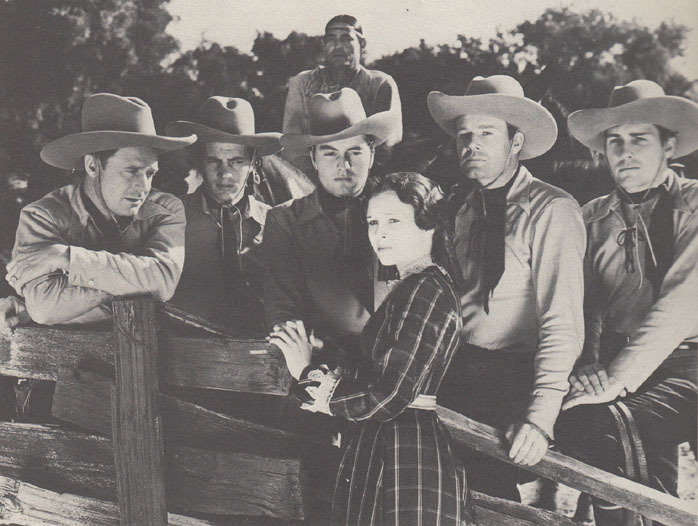 Above: A publicity still showing Lone Ranger’s leading lady Lynne Roberts with the five Ranger “suspects,” and with Chief Thundercloud as Tonto. Left to right, the white-hatted heroes are Hal Taliaferro, Herman Brix, George Montgomery, Lane Chandler, and Lee Powell. Taliaferro played a small one-chapter part as a good-natured townsman in The Great Adventures of Wild Bill Hickok (Columbia, 1938), cheerily and un-condescendingly questioning a group of Abilene kids about the junior-lawman group they’d formed to help town marshal Hickok (Bill Elliott). Overland With Kit Carson (Columbia, 1939) gave him a much bigger role as Jim Stewart, the owner of a trading post in the wilds west of the Rocky Mountains. The Stewart post served as a headquarters for Kit Carson (Bill Elliott) and other frontiersmen, while Stewart himself served as an able adviser and helper to the “Carson men” in their battle against the mysterious outlaw chieftain known as Pegleg; the trader occasionally came under suspicion of being Pegleg himself, but ultimately proved to be as dependable as he appeared. Taliaferro played this part with an appealing combination of expansive joviality and hardy self-assurance, but also acted shifty enough on occasion to keep the audience guessing as to whether he might be a secret villain. 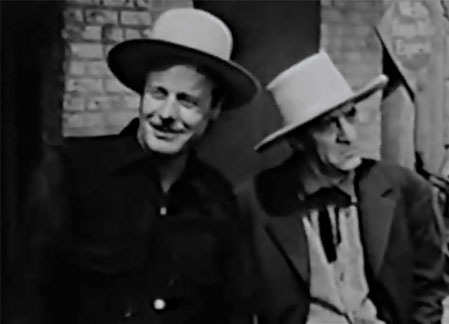 Above: Hal Taliaferro and the secretly villainous Walter Wills react with pleasure and displeasure (respectively) to a report of the latest triumph of the titular hero in The Great Adventures of Wild Bill Hickok (Columbia, 1938). 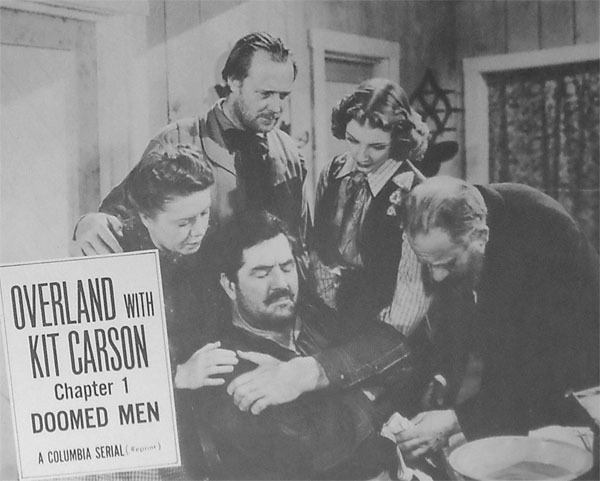 Above: Wounded trapper Olin Francis (seated) is assisted by (left to right) Flo Campbell, Hal Taliaferro, Iris Meredith, and Francis Sayles in Overland With Kit Carson (Columbia, 1939). Taliaferro spent the 1940s working almost exclusively in B-westerns (and occasional A-westerns) for Republic Pictures and in the generously-budgeted features of independent producer Harry Sherman (who turned out the Hopalong Cassidy films and many other Westerns). Taliaferro also made seven more serials during the decade, all of them (with one exception) Republic outings; the first of these was the excellent Adventures of Red Ryder (1940), in which he played ranch foreman Cherokee Sims–the tough, weather-beaten, and eminently trustworthy sidekick of rancher hero “Red” Ryder (Don Barry). Cherokee provided plenty of assistance to Red in his battle against a ruthless gang of land-grabbing outlaws, but was gunned down in Chapter Eleven, leaving the hero to avenge his friend and finish the fight. 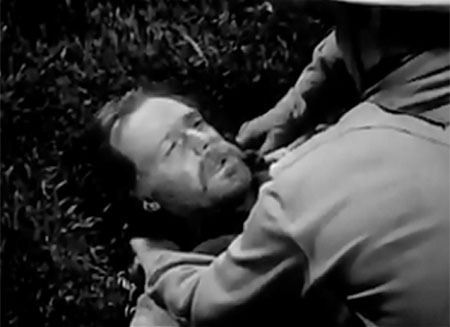 Taliaferro lent color and humor to his uncouth but savvy character without ever interfering with Ryder‘s gritty and serious overall tone; he also turned in an understated and extremely moving death scene that ranked as one of the best ever seen in a serial–gruffly attempting to walk off his gunshot injury, then collapsing and wryly telling Red “I can’t get the job done” before quietly slumping backwards. Above: Hal Taliaferro watches as Don Barry confronts crooked sheriff Carleton Young in Adventures of Red Ryder (Republic, 1940). Above: Don Barry (back to camera) and Gene Alsace (hand only visible) tend to Hal Taliaferro’s dying Cherokee in Adventures of Red Ryder. King of the Mounties (Republic, 1942) gave Taliaferro a one-scene role as a cagy henchman named Ed Johnson, who coolly sauntered into RCMP headquarters–ostensibly to acquire a hunting license–and successfully planted a listening device while the Mountie on duty was doing paperwork. Haunted Harbor (Republic, 1944) featured him in a larger heavy role as Lawson, the proprietor of a South Seas café who was secretly in cahoots with gold-smuggler Roy Barcroft. His character only received about four or five scenes, but each of them were memorably villainous; in fact, Lawson came off as the nastiest heavy of Taliaferro’s entire serial career. His sneering taunts of ship-skipper hero Kane Richmond over the latter’s financial reverses, his gloating when it looked like Richmond was about to hang for murder, and his cold-blooded harshness when he threatened to torture heroine Kay Aldridge all made him seem really hateful–and made it slightly disappointing when Lawson dropped out of the serial halfway through, without receiving any on-screen comeuppance. Above: Hal Taliaferro engages in espionage under the nose of William Bakewell in King of the Mounties (Republic, 1942). Above: Duke Green holds Kay Aldridge as Hal Taliaferro prepares to close a vise on her hand in Haunted Harbor (Republic, 1944). Zorro’s Black Whip (Republic, 1944) cast Taliaferro as a frontier badman named Baxter, one of the two chief henchmen of an outlaw boss (Francis McDonald) who was determined to keep law and order out of the Idaho territory by sabotaging the settlers’ campaign for statehood. 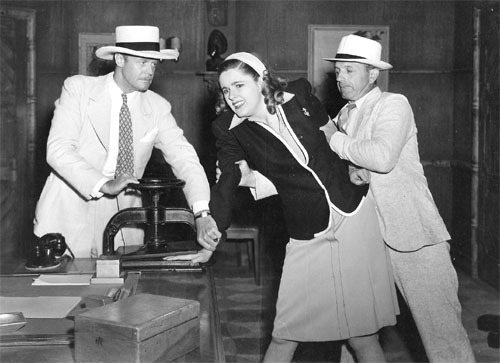 Since McDonald’s character posed as a respectable citizen, it fell to Taliaferro to handle the serial’s active villainy; he and co-henchman John Merton repeatedly tangled with newspaper editress Linda Stirling (who assumed the guise of a masked rider called the Black Whip) and with undercover lawman George J. Lewis. Taliaferro’s villainous characterization here was less unrelentingly unpleasant than his Haunted Harbor one, but he definitely made Baxter seem formidably mean and tough; he also gave the character an air of overconfident smugness that made him subtly amusing at times, and handled sarcastic dialogue (“Skip the Fourth of July speech, sister”) with great flair. 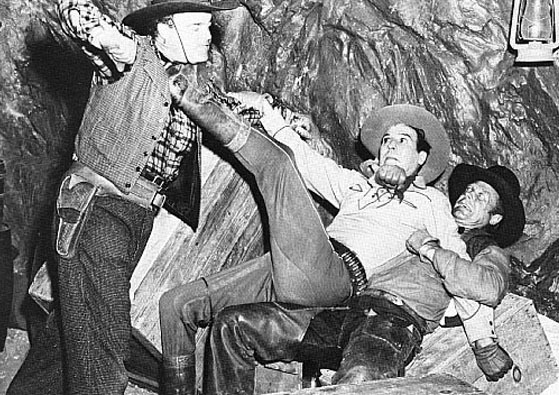 Above: Hal Taliaferro tries to overpower George J. Lewis as Lewis kicks John Merton in the face in Zorro’s Black Whip (Republic, 1944). 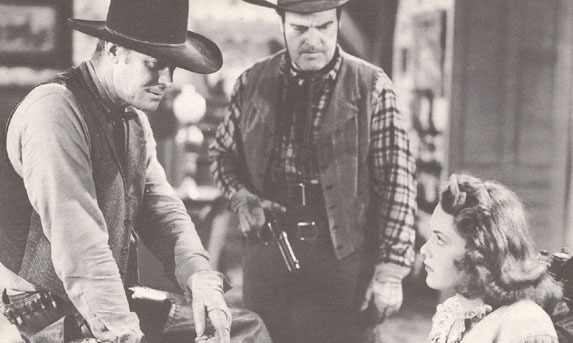 Above: Hal Taliaferro and John Merton threaten Linda Stirling in Zorro’s Black Whip (Republic, 1944). Federal Operator 99 (Republic, 1945) gave Taliaferro his last major serial-villain role; as in Zorro’s Black Whip, he played the chief action heavy–in this case, a gangster named Matt Farrell, the right-hand man of suave master criminal Jim Belmont (George J. Lewis). Though his Montanan drawl sounded a little odd coming from a supposed big-city hoodlum, Taliaferro gave an excellent henchman performance in Operator nevertheless–pulling off stickups and robberies with swaggering aggressiveness and intimidating gruffness, but frequently displaying befuddlement when his more devious boss was explaining intricate plans to him; the ever-present contrast between Taliaferro’s brusque and straightforwardly thuggish characterization and Lewis’s suave depiction of Belmont made the heavies’ plotting scenes very entertaining. Above: Hal Taliaferro as Matt Farrell in Federal Operator 99 (Republic, 1945) prepares to make a daring airborne rescue of his imprisoned boss Jim Belmont. 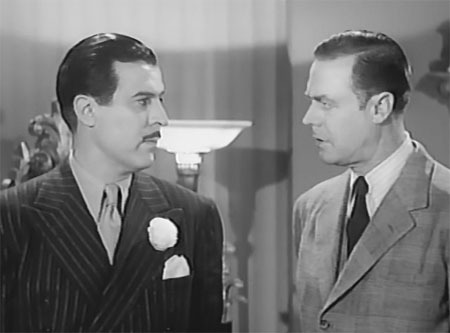 Above: George J. Lewis surprises Hal Taliaferro in Federal Operator 99. Taliaferro effectually concluded his serial career with a delightful character turn in The Phantom Rider (Republic, 1945–not to be confused with Taliaferro’s Universal serial of the same name). As an illiterate but canny prospector named Nugget, he capably assisted frontier doctor/masked rider Jim Sterling (Robert Kent) in a fight against an outlaw band–when he wasn’t valiantly trying to master “book larnin'” in the second grade of a one-room schoolhouse. 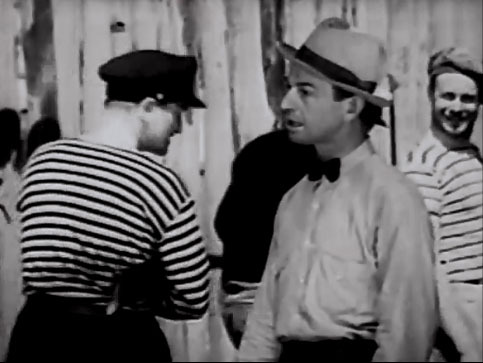 Taliaferro achieved a perfect comic balance in this role–affecting an awkward gait and accentuating his usual drawl for humorous effect, but never making Nugget seem like a mere buffoon; his sharply intelligent reactions to dangerous situations were just as credible as his sheepish manner when caught chewing tobacco in school, and seemed to be part of one consistent character. Above: Hal Taliaferro tackles villain Jack O’Shea in a lobby card for the retitled reissue version of The Phantom Rider (Republic, 1945). Above: Hal Taliaferro asks Robert Kent to decipher a note that contains a lot of “them third-grade words” The Phantom Rider. 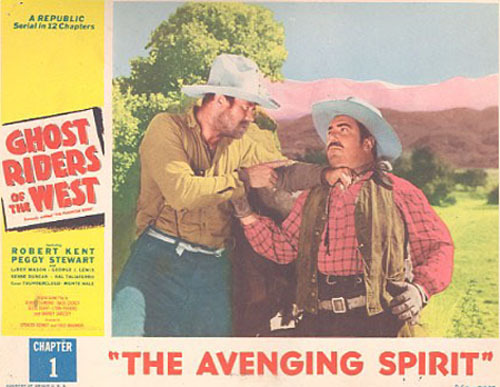 Taliaferro did make one more serial after The Phantom Rider—The Scarlet Horseman (Universal, 1946), in which he played a oddly small bit as a henchman who pursued the hero (Peter Cookson) in a horseback chase towards the end of an episode, briefly fought him, apparently shot him off a cliff to end the chapter–and then snuck off in the next episode, all without uttering a word of dialogue. Taliaferro’s supporting parts in Western features began to slack off during the late 1940s; he appeared in a few more films (most of them for Republic) in the early 1950s, but retired from screen work around 1952. After leaving the picture business, he returned to Montana and to the Bones Brothers ranch (still owned by his family); he divided most of his post-Hollywood years between ranching and painting Western landscapes–a hobby he’d pursued in his spare time during his movie career. After a “retirement” of over twenty-five years, a succession of strokes forced him to move to a nursing home in Sheridan, Wyoming, the same town in which he had been born; he passed away there in 1980. Hal Taliaferro was one of the most versatile and one of the best of Hollywood’s B-western performers; few other former cowboy stars were able to so successfully and completely reinvent themselves as character actors–or to win such a wide range of supporting roles. Though his serial credits were scarce in comparison to his B-western ones, his major chapterplay characterizations are among the genre’s most noteworthy. Above: Portraits of Hal Taliaferro as the various character types mentioned in the opening paragraph. Top left: A 1920s arcade card of Taliaferro as leading man Wally Wales. Top right: Taliaferro as an outlaw in an early-1940s B-western publicity still. 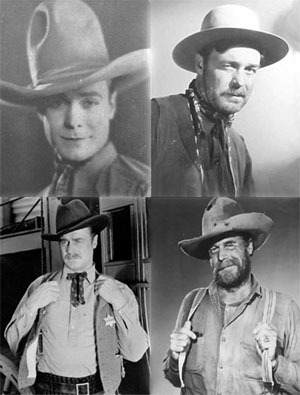 Bottom left: Another publicity still of Taliaferro as a sheriff. Bottom right: Taliaferro as quirky sidekick Nugget in the serial The Phantom Rider (Republic, 1945). Acknowledgements: My thanks to the Old Corral’s excellent page on Taliaferro/Wales, which provided a lot of information itself and also furnished some useful additional links (particularly the one to the University of Wyoming site). I believe to have black and white photos of Wally Wales, about 50 of them. 8x10s, punch holes on top left corner. Any advice what to do with them? You could try putting them up for sale on Ebay, if you’re looking to realize a profit on them. If not, you might try contacting Chuck Anderson of the Old Corral (his e-mail is oldcorral at comcast.net; I’m leaving out the @ sign so this post doesn’t cause him to get targeted by webcrawlers). He has a section on Wales/Taliaferro’s Westerns, and if these are photos from Wales’ Western star days, I’m sure he would be interesting in the donation of some of them, for scanning purposes. Since my site focuses primarily on Taliaferro’s serials, I wouldn’t have as much use for them.